One of my friends, who runs his own offshore development shop, was having a nightmarish situation with one of his customers. He’s way overdue on a release, the customer is screaming everyday, he’s paying his team from his own pocket, the customer is sending an ever increasing list of changes and so on. Typical offshore development story. Here’s how we discussed some ideas to get out of such a situation and make sure it does not repeat in future. Kabir: Hey, can you help me? My customer is making us work for free for extra two months to fix bugs from our last delivery. We did what he said. But after he saw the output, he came up with a hundred changes, which he somehow presents as bugs or missing features and makes them look like they are all our fault and making us work for the last two months for free. He is sending new changes every week. We have no idea when we will complete the iteration. Omar: I see. Did you get a signed list of requirements from the customer before you started the development? Kabir: Of course, I did. He sent us a Word document explaining what he wants and we sent him a task breakup with hour estimates and total duration of three months. Now after three months when we showed him the product, he said, it’s nowhere close to what he had expected. Then he sent a gigantic list of things to change. Omar: All of those are bugs? Kabir: Of course not. Most of them are new features. Omar: Then why don't you say those are new features? You have the original Word document to prove. Just ask him to show where in the Word document did he say X needs to be done? Omar: OK, stop. I see what’s your problem. Some customers will always try to make you work more for less money. They will try to squeeze out every bit of development they can for their bucks. So, you have to be extra careful on how much you commit to them and make sure they cannot chip in more requirements while development is going on or when you deliver a version. Mockups are one good way to make sure things are crystal clear between you and customer. Did you not show him mockups of the features that you will be building and make him sign those mockups? Kabir: Yes, I made some mockups. But they were simple mockups. I did not show the validations or all those side jobs like sending verification emails. Omar: Did you run those mockups through your engineers? They could have told you about those details. Kabir: No, I did not because developers don't work on the project until I get a signoff from the client. So, I prepare all the mockups myself to save cost. Omar: So, this is the first problem. The mockups were as ambiguous as the customer’s Word document. Basically the mockups just reflected the sentences in the Word document. Mockups did not really show all possible navigations (ok, cancel, forgot, signup), system messages, system actions behind the scene, workflows, etc. Are you getting what I am saying? Kabir: Yes. Come on, I am not a developer. I can’t think of every single detail. That’s what developers do when they start working on it. Omar: But you provide estimates based on your mockups right? So, if the mockup shows there’s only a simple login form and change password link, you charge 5 hours for it. But then when you realize you have to send email for change password, email needs to contain a tokenized URL, that URL needs to show a change password form, where you need to validate using CAPTCHA, etc., it becomes 20 hours of work. Right? Kabir: Well yes. Generally I multiply all estimates by 1.5 just to be safe. But things have gone 3X to 10X off original estimate. Omar: Yes, I just gave you an example how a login form estimate can go 4X off when the mockup is not run through an engineer and the important issues are not addressed. Kabir: So, you are saying I have to prepare all mockups with an engineer? Omar: In general, yes, since you aren’t good enough to figure those out yourself; no offence. You will get good enough after you build a couple of products and get your a** kicked a couple of times, like mine. Mine got kicked about 17 times. After that, it became so hard that when I sit on it, I produce really good mockups. After some more kicks, I hope to get 100% perfect in my mockups. Kabir: Ok, so the process is, I get a Word doc from the customer. I produce mockups from it. Then I run them through engineers to add more details to them. Then after review with customer, I run them through engineers again to estimate. Then I ask the customer to sign-off on the mockups and the estimate, correct? Omar: Well, first let me say, you don’t do a three month long iteration since you are far away from your customer. You do short two weeks sprints. Do you know SCRUM? Kabir: Yes, one of our teams does it. Omar: I assume the team that got their a** kicked don’t do it? Omar: OK, then first you start doing SCRUM. I won’t teach you details. You can study about SCRUM online. Now, you collect ‘user stories’ from customer. If the customer does not give you user stories, just vague paras of requirements, you break the requirements into small user stories. Understood? Kabir: No, give an example. 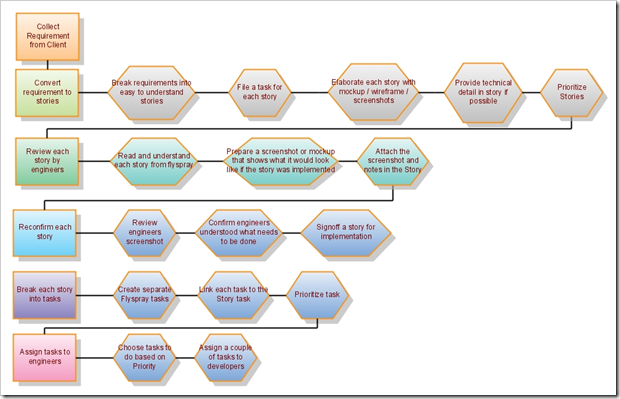 Understood what user stories are? Kabir: Yes, but you are missing all the validations that we also overlooked and now we are working two months for free. This “user stories” do not help at all. All possible alternate navigation from the main user story. For example, while entering password, user can click on a help icon so that user can see what kind of passwords are allowed. Kabir: Now it’s starting to make sense. Then what? Show these user stories to customers? Omar: No, show them to your lead engineer who has enough experience to identify if you missed something. Your Engineer should point out all the alternative system actions at least. Kabir: What if my Engineer can’t figure them out? What if he’s just as dumb as me? Omar: Fire him. Get a pay cut for yourself. Kabir: Seriously, what do I do if that’s the case? Omar: Your engineers will *always* come up with issues with your mockups. You should always use another pair of eyes to verify your mockups and add more details to it. You aren’t the only smart guy in the world you know? Kabir: I thought I was, ok. What’s next? Omar: File those user stories in your issue tracking system in some special category. Say “User Stories” category. What do you use for your issue tracking system? Omar: Good enough. Create a new project in Filespray named “User Stories”. 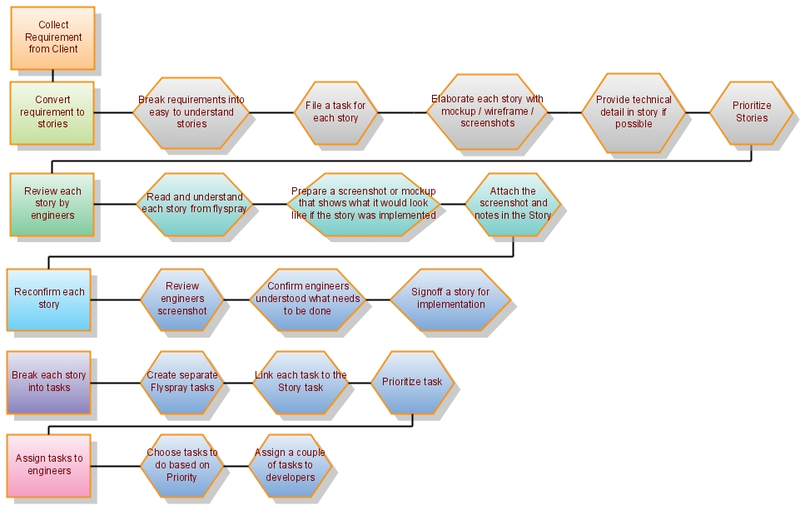 File tasks for user stories. Each story, one task. Attach the mockup to the tasks. Then create one account for your customer so that customer can login and see the user stories, make comments, suggest changes, etc. You will get the conversation with your customer recorded as comments in the task. This comes handy for engineers and for resolving disputes later on. Moreover, get your customer to prioritize the tasks properly. Understood? Kabir: I don’t think customers will go through that trouble. Customers will ask for some Word document that has all the user stories and she will write in the document what are the changes. I will have to reflect them in Flyspray. Is it really necessary to file user stories in Flysrpay? Can’t I just maintain one Word doc with a customer? Omar: Absolutely not. Word documents suffer from versioning problem. You have one version, your customer has another version, your engineers have another version. it becomes a nightmare to move around with Word docs which has many user stories in it and keep them in sync all the time. Moreover, referencing a particular use case also becomes a problem. Say at a later stage of the project, there’s a bug which needs to refer to User Story #123. You will have to say User Story #123 in \\centralserver\fileshare\user stories1.doc. Now if \\centralserver dies, or you put it somewhere else, all these references are gone. Don’t go for Word doc. Keep everything on the web that you can refer to it using a URL or small number. Another problem is numbering stories in Word Doc. Word won’t produce a unique ID for you. You will end up with duplicate user story numbers. If you use Flyspray, it will generate unique IDs for you. Kabir: OK, let me see how I convince my customer to use Flyspray. Omar: Yes, you should. If Flyspray is hard for customers, use some simple issue tracking system that’s a no-brainer for non-engineers. Some fancy AJAX based todolist site will be good enough if it has a picture attachment feature and auto task number feature. Kabir: OK, I will find such a website. So, I got the user stories done. Now I show them to customer, review, make changes. Finally I get the customer to sign off on User story #X to #Y for a two weeks sprint. Then what happens? Omar: On your first day of sprint, you do a sprint planning meeting where you present those user stories to your engineers and ask them to break each story into small tasks and estimate each task. Make sure no engineer puts 1 day or 2 days for any task. Break them into even smaller tasks like 4 hours of tasks. This will force your engineers to give enough thought into the stories and identify possible problems upfront. Generally when someone says this is going to take a day or two, s/he has no idea how to do it. S/he has not thought about the steps needed to be done to complete that task. You are getting an estimate that’s either overestimated or underestimated. Forcing an engineer to allocate tasks in less than 4 hours slot makes an engineer think about the steps carefully. Kabir: If engineers do this level of estimate, they will think about each task for at least an hour. This is going to take days to finish estimating so many tasks. How do you do it in a day? Omar: We do 4 hours Planning meeting where Product Owner explains the stories to engineers and then after 30 mins break, another 4 hours meeting where engineers pickup stories and break them into tasks and estimate on-the-fly. This 4 hours deadline is strictly maintained. If Product team cannot explain the tasks for a sprint in 4 hours, we don’t do the tasks in the sprint. If the tasks are so complex or there are so many tasks that they cannot be explained in 4 hours, engineers are unlikely to do them within one/two week long sprint. Similarly if engineers cannot estimate the tasks in their 4 hours slot, the tasks are just too complex to estimate and thus have high probability of not getting done in the sprint. So, we drop them as well. Kabir: This is impossible! No one’s going to attend 8 hours meeting on a day. Besides, telling them to estimate a task on the spot is super inefficient. They won’t produce more than 60% correct estimates. They will give some lump sum estimate and then go away. Omar: Incorrect, if engineers cannot make estimates of a task in 10 to 20 minutes, they don’t have the capability of estimating at all. If your engineers are habituated to take a task from you for estimating and then go to their office, talk to their friends on the phone, drink soda, walk around, gossip with colleagues and end of the day if they have the mood to sit and think about the estimate then open a new mail, write some numbers and email it to you; they better learn to do this on-demand, when requested, within time constraint. It’s a discipline that they need to learn and implement in their life. Estimates are something they do from the moment they wake up to the moment they go to sleep. Besides, the planning meeting is the best place to estimate tasks - all engineers are there, product team is there, your architects should be there, QA team is there. It’s easy to ask questions, get ideas and helps from others. Kabir: I have engineers who just can’t do well under pressure. They need some undisturbed moment, where they can sit and think about tasks without anyone staring at them. Omar: Train them to learn how to keep their head cool and do their job in the midst of attention. Anyway, let’s stop talking about these auxiliary issues and talk about the most important issues. Where were we? Kabir: About dropping tasks, I already negotiated with the customer that we are going to do story A, B, C in this sprint. Now after the sprint planning meetings, engineers say they can’t do B. The problem is that I have already committed to deliver A, B, and C to customer within 2 weeks and sent him the invoice. How do I handle this? Omar: How do you commit when you don’t know how long A, B, and C are going to take? Kabir: The customer tells me to do A, B, C within two weeks. And after doing some preliminary discussion with engineers, I commit to the customer and then do the sprint planning meeting. I can’t wait until the sprint meeting is done and developers have given me estimates of all the tasks. Omar: Wrong. You commit to the customer after the sprint planning meeting is done. Before that, you give the customer just a list of things that you believe you can try to do in the following two weeks. Tell the customer that you will be able to confirm after the sprint planning meeting. The time to do a sprint meeting is only 8 hours = a day. So, end of the day, you have some concrete stuff to commit to the customer. From your model where you give engineers days to estimate, it won’t work. You have to finish planning within a day and end of the day, commit to customer. Omar: This is a hard situation. I am tempted to say that you tell your customer, “Go away!”, but in reality you can’t. You have to negotiate and come to a mutual agreement. You cannot just obey customer and say “Yes Mi Lord, we will do whatever you say” because you clearly cannot do it. The fact is, end of the sprint, you *will* get only A and C done and B not done. Then customer will Fedex you his shoes so that you can ask someone to kick you with it. Kabir: Correct, so what do I do? Omar: There are tricky solutions and non-tricky honest solutions to this. Tricky solution is, say you engaged 5 engineers in the project who can get A and C done in time. But you realize you need another engineer to do B, otherwise there’s no way you can finish A, B and C in two weeks. So, you invoice the customer with 6 engineers and get A, B and C done. Now the customer may not agree with you paying for the 6th engineer. Then you do a clever trick. You engage the 6th engineer free of cost in this sprint. Don’t tell the customer that there’s an extra head working in the project. Or you can tell the customer that out of good will, you want to engage another engineer free of cost to make sure that the customer gets a timely delivery. This boosts your image. Later on, when you get a sprint that’s more or less relaxed and 4 engineers can do the job, you secretly engage one engineer to some other project but still charge for 5 engineers to your customer. This way you cover the cost for the 6th engineer that you secretly engaged earlier sprint. This is dirty. But when you have so hard a** customer who’s forcing you “what”, “when” and “how” all at the same time and is not open to negotiation, you have no choice but to do these dirty tricks. You can also add extra one hour to every task for every engineer in a sprint or add some vague tasks like “Refactor User object to allow robust login”. This way, you will get quite some amount of extra hours that will compensate for the hidden free engineer that you engage. You get the idea right? Kabir: Ingenious! And what’s the honest and clear way to do these? Omar: You negotiate with the customer. You tell your customer that he or she can only have any two choices from Money-Scope-Time. This is called the project management triangle. Do you know about this? So, your customer can specify any two. If customer specifies Scope and Time (“what” and “when”), then customer must be flexible on Money or “how” you do it within those two constraints. If customer specifies Money and Scope, then you are free to decide on time. You engage lower resource and take more time to get things done. Got the idea? Kabir: Yes, understood. Nice, I can show this to the customer and educate him. Is there any book for the evil tricks that you just gave me? Omar: No, I might write one soon. I will name it “Customers are evil, so be you”. Raisul: Hey, I have fixed people engaged in a project. I can’t change the number of people sprint-to-sprint to compensate for change in money. So, the triangle does not work for me. What do I do here? This is for situations where you have fixed resource engaged for a particular customer. In that case, you cannot reduce people on-demand because you cannot reassign them. Such a case requires different strategy. 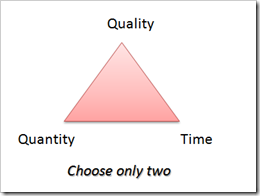 If the customer forces you Quality and Time, the customer must be willing to sacrifice Quantity. The customer cannot say, produce perfect login form in 2 weeks and add cool Ajax effects to it. The customer has to sacrifice cool Ajax effects, or sacrifice *perfection* of login form, or sacrifice number of days. From the above two triangles, which one’s more appropriate for you? Kabir: The second one because the customer hires 5 engineers from me. I cannot take one away and engage in a different project. Well, not openly of course. Omar: OK, sounds fair. What else do you need from me? Kabir: Let me think about all these. This is definitely worth thinking. I have to figure out whether to play fair or play clever. End of the day, I need to produce great product, so that, I get a good recommendation and future projects from the customer. So, I need to do whatever it takes. It’s hard to run an offshore dev shop where we kinda have to work like slaves and like a bunch of zombies mumble every 10 mins – “Customer is always right”. You are very lucky to have your own company. Omar: I had two offshore dev shops before Pageflakes. I know how it feels. Wish you good luck. I have seen your product, you guys are building a great ASP.NET MVC+jQuery application. Release it. It’s worth showcasing. Handy for Product Managers. Enlightening for developers. Here's the full version of the chart. I am interested to learn if you have been through such situations and how you came out of it. If this story reminds of you of some painful past, please do share it in the forum. In breaking work into user stories and tasks how do you avoid bloating some tasks? A two week sprint to complete a login form now has to include a lot more infrastrucute work than subsequent sprints doesn't it? Also,who keeps their eye on the "big" picture to make sure a collection sprints doesn't just produce an application made up of lots of "little" solutions? Introduce more user stories for each area. User stories are just not end-user point of view. It can be a developer point of view. For ex, As a Developer, I want to have a database where I can store user accounts so that I can implement the login feature. Then you can have user stories for some IT guy, As a Sys Admin, I want money from finance so that I can buy a new database server for developers to store user accounts. So, you capture all the stakeholders associated with tasks. Not just end-user. End user is just one of the stakeholder for each task. So do you have note dependencies between stories? If a customer prioritizes the "login form" as number one, do you have to reply with "well that requiries these additional stories - db, server ... as well, therefore we need total of x weeks for this sprint"? Exactly. That's the point. To show what it takes to really get something done so that the underestimation never happens and expectation is managed across the board. Even if that means running longer sprints? So if you're starting from a new project from scratch, you customers prioritized they'd like - these early user stories are more likely to depend on "infrastructure" work - this might mean longer initial sprints, followed by shorted ones? That's one way to adjust the demand. You can do three week long sprints in the beginning. Then move to a two weeks long sprint. awesome article, although evil is truly a race to the bottom. walking away from that customer beats sinking to their level. aside from that, great exposition on a topic we don't get enough discussion of. As always, a great article. ... and fun to read too. Thanks. A nice article that I enjoyed reading. A five from me. Your recommendations apply in all walks of life!!! A similar example in a totally different field, & from the view of the customer: Is getting a builder to put an extension on your house. You want an extra room, & you take for granted it will be plastered, wired, plumbed. etc. But when you agreed the schedule & cost with the builder, did either of you break it down to include the exact positions of the power points, light switches, services, finishes, etc? Probably not!!! So you end up with a situation where the builder does his bit of building the structure, but in the (worst case) the builder states that plumbing, wiring, & finishes are not part of the price. As they were not properly specified when you asked for an extension & price for the work. Were they even in the original client brief? Does a brief even exist? Who should pay to move the services when their exact positions were not specified by the client in the first place? And fleshing out these requirements as you go along ALWAYS incurs extra costs, or bad feelings. The client believes these were part of the original job, but the contractor views these as extra requirements, as they were not specified when they committed to a price. Who is at fault??? The client & contractor relationship always starts well, but generally deteriorates. So good documentation & requirements, is not to just get the project moving. It is also good business & PR to ensure customer satisfaction, repeat business, & a professional image..
Great article 5 stars from me!!! I think most of the offshore project has the same scenario. Great article, both very detailed and practical. However, I feel that your approach fills in some missing gaps, like specifying even more info to user stories and some feedback. I think I will extend my own method to incorporate more of your workflow. It's all good, but you really nailed what is good about SCRUM. I mean, go back and read it as if someone was ONLY interested in "Why should I use SCRUM?". You totally made the case when others have huge articles about it and people still come away confused. Also the thing about the 4 hour estimations. I thought I was the only one who realized that. My thing was, if a person doesn't write down, on paper, the exact steps they plan to do, and a time estimated next to each step... the estimation is worthless.